Philly.com features a story and video on the owner of the Cam-Am Spyder and the growing popularity of three-wheel trike motorcycles. 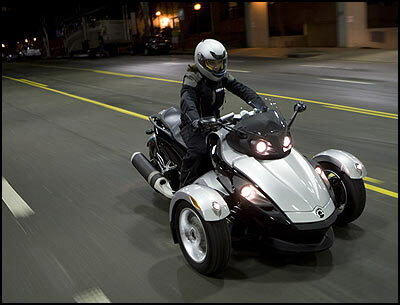 Philly.com reports that trikes have been around for a while, yet the three-wheel Can-Am Spyder by Bombardier Recreational Products is an attention grabber. Spyder owners find their futuristic-looking rides cause onlookers to stop and stare. Resembling a cross between a snowmobile and a sleek sport bike, the Cam-Am Spyder's looks are attracting more than long looks from other drivers, Hollywood film producers love it too. Expect to see the Spyder in the upcoming Transformers sequel and the film-adaptation of GI Joe. Trikes are finding new popularity with riders who seek the open road experience of motorcycle riding, yet seek the stability that a three-wheel vehicle offers.